Next week we head off for a week of camping in Algonquin Park. The other day someone told me that they heard Algonquin Park is the size of Wales! I believe it. When I was a kid our family always went camping. 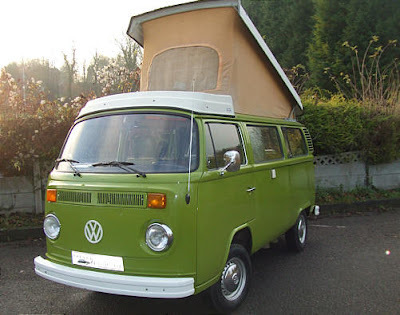 My grandparents owned a 1970’s Volkswagen camper (just like the one in the picture above), green…which we lovingly called “snot-ball” We packed up that camper every summer and travelled all over Ontario. So, I am not unfamiliar with camping. However, as with most things in life, when you become a parent everything shifts – suddenly I’m the responsible one! How did that happen? This week I’ll give some tips on how to prepare for a camping trip with kids…from the perspective of the adult who has to find a way to entertain, feed and cloth 2 children with no electricity, no fridge and no comfortable bed. First things first…we have to get there. The road trip. Unfortunately, there aren’t a lot of campsites in the city – so we have to drive a few hours to get to our destination. If I think back to camping trips of my youth I remember sitting on a piece of wood slipped between the driver and passenger seats…no seatbelt! We would wander around inside the camper, grabbing snacks from the cupboard when we got hungry. A little different than shoving my family of four into our Golf! So, the only way to cope is with plenty of preparation. Each of my daughters’ has their own clipboard filled with things to do. The benefit of the clipboard is that the pages are on a hard surface and they are clipped together, not flying all over the place. I print off many, many colouring pages, crosswords, word searches, math pages, and puzzles. Then I add to the stack a few car bingo and scavenger hunt pages. Car bingo and scavenger hunt pages have become a favourite in our vehicle. These games have pages filled with things you usually see from the car window…trucks, farms, animals, street lights, construction signs, etc. We use these cards more as a seeking game…no one really wins…we all do. Now, as for colouring tools there is a strict “no markers allowed” rule in our car – so crayons and pencil crayons it is. Here are a couple of my favourite online sources for printables. A fully stocked little cooler in the car is another key to our success. I fill the cooler with pre-cut fruit, my cheese crackers, cookies/muffins, veggies, whatever! As long as there is “one more thing” to pass back and hold them over until the next pit stop – we’ll all survive. Don’t forget the water…lots of water. Everyone knows this trick. When we get out of the city it is time to pass back a secret toy. Ever since LEGO created their line of mini-figures in individual bags, they have been our toy of choice. They are perfect because they are inexpensive, have to be assembled and introduce a whole new world of play to the back seat. What secret toy do you use? What we sometimes forget is that not only do we have to get to the campsite, we also have to get home. This means making sure things don’t get too unorganized in the backseat. Also, I usually hold back some colouring pages and game pages for the return trip. Thankfully on the way home the kids are generally tired and full of excited chatter about our trip. The best thing about long car rides is that they are like an extended stay at the dinner table. You can’t help but chat. Don’t get me wrong there are times when we hear fighting and whining from the back seat. And it wasn’t always sunshine and roses…my youngest daughter was one of those babies that HATED being in a car seat. She would scream for hours…on end. What I have learned, and will say over and over again, with enough distraction kids can do anything you want them to do. They won’t even realize they did it! So, now that we have survived the drive…how do we survive the camp trip itself! More tomorrow. Previous Post: « 8 years old!